PORT CITIES NYC, was the first movement of a global art journey. ​In May 2016, audiences met at Pier 11 in the Financial District, ferried across the harbor accompanied by an original soundscape, docked in Red Hook’s working port, and boarded The Waterfront Museum Barge for a multimedia performance exploring the ghosts of Wall Street and systemic violence from Slavery to today. 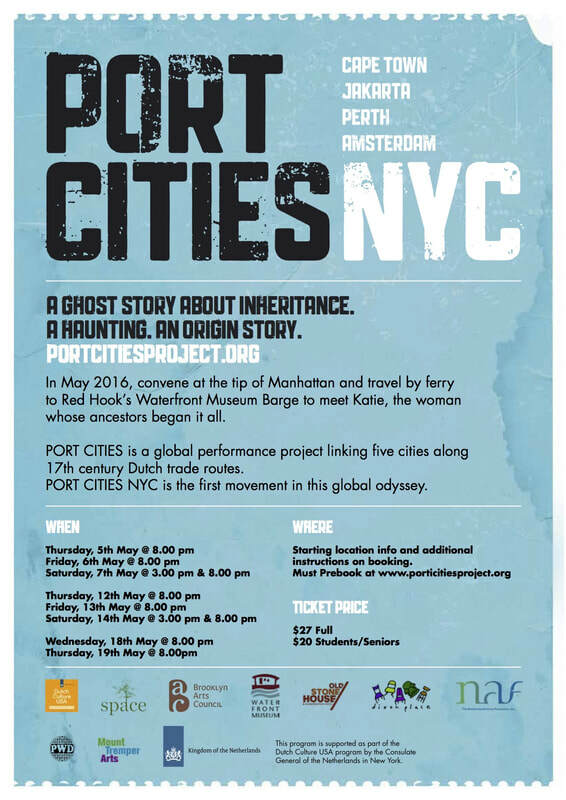 PORT CITIES NYC is a ghost story about inheritance. A haunting. An origin story. Katie has felt haunted since she was a little girl. Knowing something about her family history, she goes in search of answers beyond the hallway of her childhood home. Examining her own hands and those of her family, her lover, and the city that birthed her, she comes face to face what what scares her most. Using the cult like popularity of The Settler’s of Catan and turning it on its head, PORT CITIES NY plays its own “Settlers of Manahatta”. An intimate, ironic and sometimes disturbing look into old New York and New Amsterdam . Here Katie’s ancestors traded, bought, sold and helped build a wall that would continue to divide many. Reckoning with family legacy, a cross racial relationship, and cycles of violence that seem to be visible on the streets of Baltimore, Ferguson and beyond, Katie must navigate through the game that has given her more playing cards than most. If she can't stop the loop, who can? And will everyone lose in the end?